Larry McDaniel, of Jacksonville, Fla., left, and his brother, Charles McDaniel, of Indianapolis, sons of Master Sgt. Charles Hobert McDaniel who died in the Korean War in 1950, are presented their father's dog tag by an official of the Army's Past Conflicts Casualty Office, Wednesday, Aug. 8, 2018, in Arlington, Va. The lone military identification tag that North Korea provided with 55 boxes of human remains last month belonged to Master Sgt. Charles H. McDaniel, an Army medic from Indiana who was killed in the openingmonths of the Korean War. 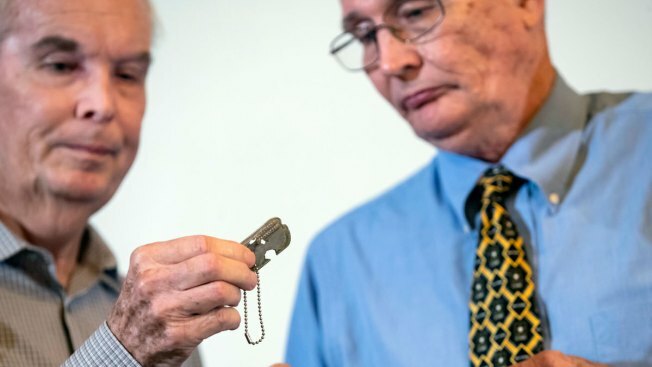 The Army on Wednesday handed McDaniel's slightly corroded dog tag to his sons, Charles Jr. and Larry, who were so young when their father perished that they have little memory of him. Charles, 71, told reporters he was moved to tears when he got the phone call at home in Indianapolis last week informing him that his father's dog tag had been returned. "At least we have this," he said, pointing to the dog tag, imprinted with the name, Charles Hobert McDaniel, and a service number. Charles Jr., of Indianapolis, told reporters he has no recollection of what his family was told when his father was reported missing in action. The dog tag is no assurance that McDaniel's remains are among those contained in the 55 boxes that the North Korean army turned over the U.S. officials at Wonsan, North Korea, on July 27. John Byrd, director of the Defense Department laboratory in Hawaii that is beginning the process of attempting to identify the remains, said the condition of the bones is judged to be "moderate to poor preservation," meaning few are whole bones and all are quite old. No personal effects were handed over by the North Koreans aside from the McDaniel dog tag. The boxes contained a number of U.S.-issued military items such as helmets, gloves and canteens, but none are associated with any specific individual. North Korea returned the remains as part of an agreement reached by its leader, Kim Jong Un, at his Singapore summit with President Donald Trump in June. Kim also agreed to cooperate with the U.S. in searching for and excavating additional remains in North Korea, where an estimated 5,300 U.S. servicemen are believed to have fallen and not been recovered. Negotiations on the terms of such future operations have not yet begun, American officials said. In "This Savage War: MacArthur's Korea," author Arthur F. Dorie wrote that the only escape route from Unsan after the Chinese fought their way into the town was closed before the 3rd Battalion, known as "Scrappy Blue," could withdraw. "Living up to the standard of their regimental motto, 'Honor and Courage,' the men of the 3rd Battalion organized a perimeter defense, and for four days and nights they turned back wave upon wave of Chinese commandos, infantrymen and cavalrymen," he wrote. Ultimately, hundreds of U.S. troops were killed or captured. A Pentagon profile of McDaniel says there is no evidence that he was captured by the Chinese and held as a prisoner of war. An eyewitness interviewed after the battles at Unsan -- another medic assigned to McDaniel's battalion -- said he believed McDaniel was killed in action. Byrd, the lab director, said it was too early to estimate how many individuals may be represented by the bones returned in the boxes. Suggesting that it might be more than 55, Byrd said that 208 boxes returned by North Korea between 1990 and 1994 turned out to contain remains from about 400 individuals, not all of whom have yet been identified.